We welcome fencers of all levels: whether it's for practice fencing or for lessons suited to your needs. We operate in both French and English, with a fully bilingual program. Our evening lessons are generally small groups or one on one with no age restrictions, however we do recommend that children under 15 join our after school program and that children much under 10 wait until student, parents and coach feel that they are ready. For those under 15, our current after school program is for 9 -14 year olds. This is somewhat flexible. Size/Age is not the real issue in fencing. Since fencing is a very strategic game, younger children usually aren't able to fully grasp the details of the sport and do not benefit from training. Starting early does not make a great difference in development of technique and may lead a child to become disinterested due to lack of understanding. Our After School Program (9-14 yrs) is offered in both the fall (September – December) and the winter (January – Mid-May) sessions. There is no summer session (June-August) offered for the after school program. However, the club is open on a reduced schedule for everyone on certain evenings (usually 2-3 nights a week, to be determined each spring). Students can start any time during the year and they can come as often or as little as they wish. Anyone who cannot attend the entire 1.5 hours is welcome to attend for the time that is available to them. 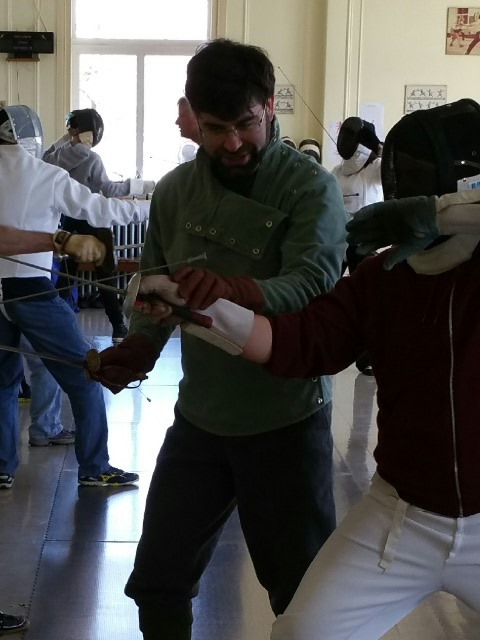 Competitive Youth Sabre Training (Intro: 9-14 yrs / Advanced: 10-16 yrs) is offered in both the fall (September – December) and the winter (January – Mid-May) sessions. 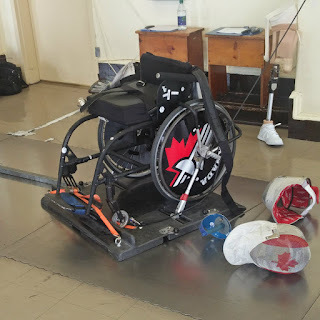 Designed for fencers with a competitive nature, students are expected to participate for the full 1.5 hours at least once per week. 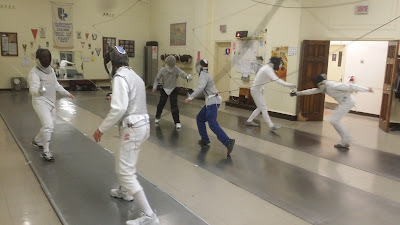 For those 15 and older, we offer small group training, individual lessons, and open fencing during our evening hours. The club is open year round with short breaks for various Holidays. Our schedule varies for each of our sessions: fall (September – December), winter /spring (January - May), and summer (June-August). Please check our schedule page for our current hours. Whether for fencing practice or for lessons, we encourage anyone interested to pass by the club anytime during club hours to see the facilities and to meet our staff. They are always happy to meet anyone interested in fencing and introduce them to the sport. At the club, you can see how we operate, and we can explain a bit about fencing (and the 3 different weapons: Epee/Foil/Sabre) to see what best suits you. If parents wish to see the club and meet our staff, but are unavailable to pass by with their children during class time, they are welcome to visit in the evening. In all cases, we suggest you pass by to visit the club and try it out before committing to a full membership. If you have any further questions, please feel free to contact us by email. For a more direct/rapid response, We will be happy to answer your questions at 514-483-6944 during club hours. Before it became the modern sport of today, fencing was the art & science of personal combat with swords. As a true martial art, no strict game rules were used to define a winner or the outcome of an encounter; except one: walk away alive, ideally without injury. The whole body counts as the target and no electric gadgets are used to score points; only proper fencing and one’s honour to acknowledge hits will prevail. The main objective of traditional methods is to safeguard life at all costs; for this, in addition to an efficient use of a sword, seemingly uncommon techniques are taught in historical fencing; including the use of the Off Hand, Disarm techniques & unique Footwork which is not limited by the bounds of a Fencing Piste. 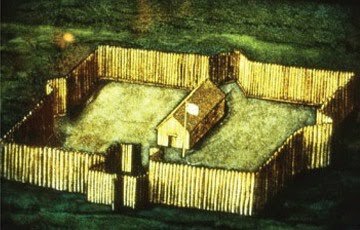 Traditional Historical Fencing can be learned through individual or group lessons. It is not an over complex method to learn; after a few lessons a new student will be able to defend him or herself with a sword. But as an Art, it will take a lifetime to Master.